La Manga, Murcia (Spain) – November 6, 2018 (travelindex.com) – Tobs Kenya Golf Safaris managed to take over the Leadership in Africa as its best Golf Tour Operator 2018 in stiff competition with 9 other African Companies. The Golf Operator’s recognition comes as a major boost to Kenya’s Golf Tourism Industry, especially now that the Kenya Open has become part of the PGA European Tour. Kenya with more than 40 golf courses and excellent golf weather conditions all-year-long, has the potential to attract tens of thousands of golfing tourists per year. 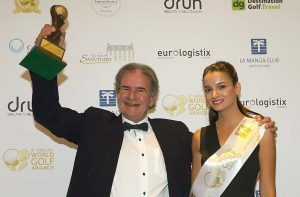 Ten years ago, in 2008 in Marbella Spain, Kenya became the world’s best Undiscovered Golf Destination, the IAGTO (International Association of Golf Tour Operators) prestigious award for new excellent golf tourism destinations. “This award represents a great honor and recognition for our company, but even more so to Kenya’s Golf Tourism Industry. I sincerely hope that the KTB uses this opportunity to develop a 5-year marketing plan, including strategy and budget to put Kenya finally on the map as a World Class Golf Tourism Destination.” Tobs Cohen said when asked for his comment. Covering an area of 1400 acres, La Manga Club in Murcia – located in South West Spain, is a luxurious resort including a 5-star hotel, villas, a wellness centre and 15 bars and restaurants. It boasts three 18-hole golf courses, 28 tennis courts, 8 natural grass football pitches, the best cricket facilities in Spain, rugby and a host of other sports. Founded 45 years ago, La Manga Club clearly displays that Golf and Sports Tourism is worth investing in. Registered as a company in 1991, Tobs Kenya Golf Safaris is a Specialized Golf Tour Operator organizing Golf Safaris into Kenya, Golf Travel Experiences around the world and luxurious Golf Events, the largest being the Kenya Golf Trophy. Copyright © 2019 New York Tourism. All rights reserved. Powered by Travelindex.